It all started for Guy Verlinde with an acoustic guitar & a blues harp. Although he never picked cotton on the fields, he surely had his share of bad luck and trouble. You can hear these feelings and thoughts in his original contemporary acoustic blues songs, with deep roots ranging from Flanders' clay, over the Mississippi Delta to the swamps of Louisiana. 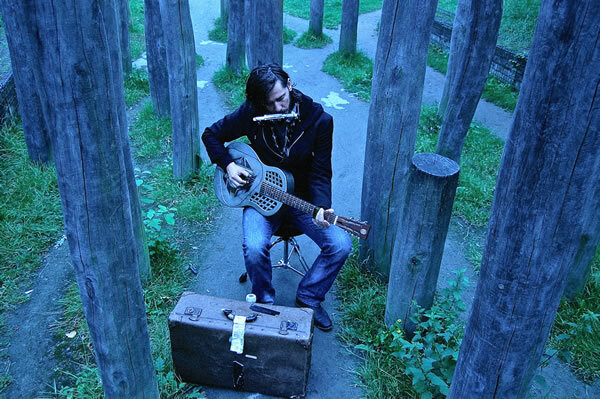 During his One Man Band shows Guy Verlinde takes his audience back to the roots of his musical career and plays a variety of resonator guitars, a Weissenborn guitar, some harmonicas, while using an old suitcase as a kick drum.